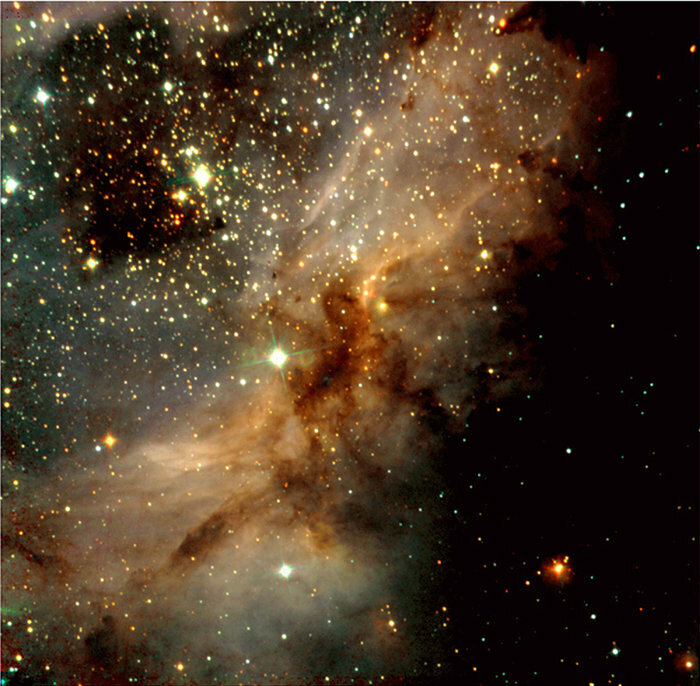 This is a near-infrared, colour-coded composite image of a sky field in the south-western part of the galactic star-forming region Messier 17. 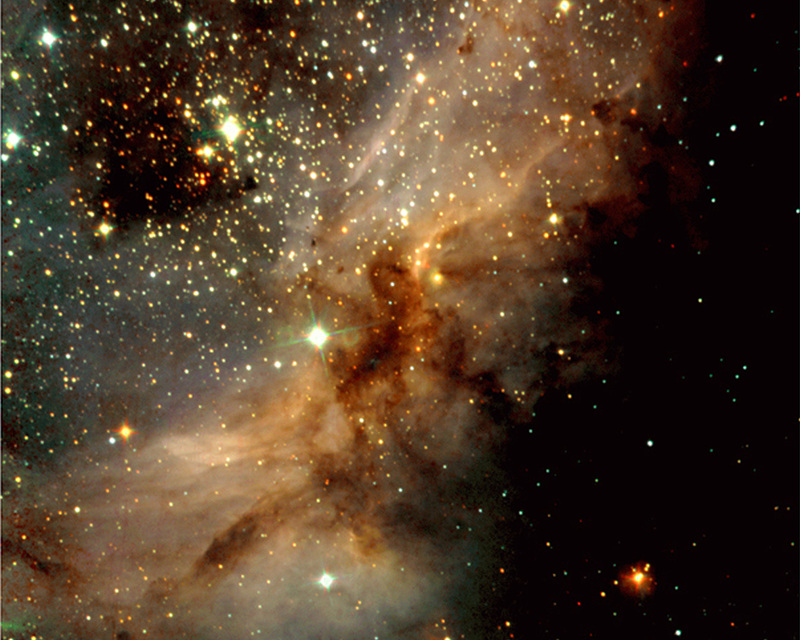 In this image, young and heavily obscured stars are recognized by their red colour. Bluer objects are either foreground stars or well-developed massive stars whose intense light ionizes the hydrogen in this region. The diffuse light that is visible nearly everywhere in the photo is due to emission from hydrogen atoms that have (re-)combined from protons and electrons. 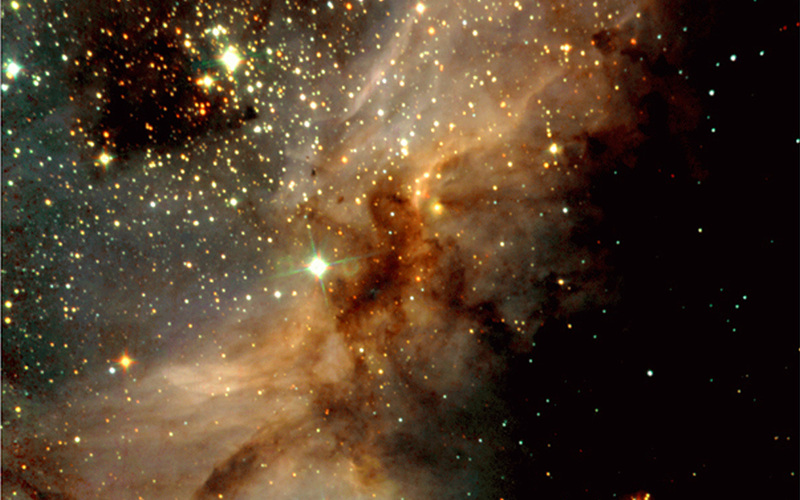 The dark areas are due to obscuration of the light from background objects by large amounts of dust — this effect also causes many of those stars to appear quite red. 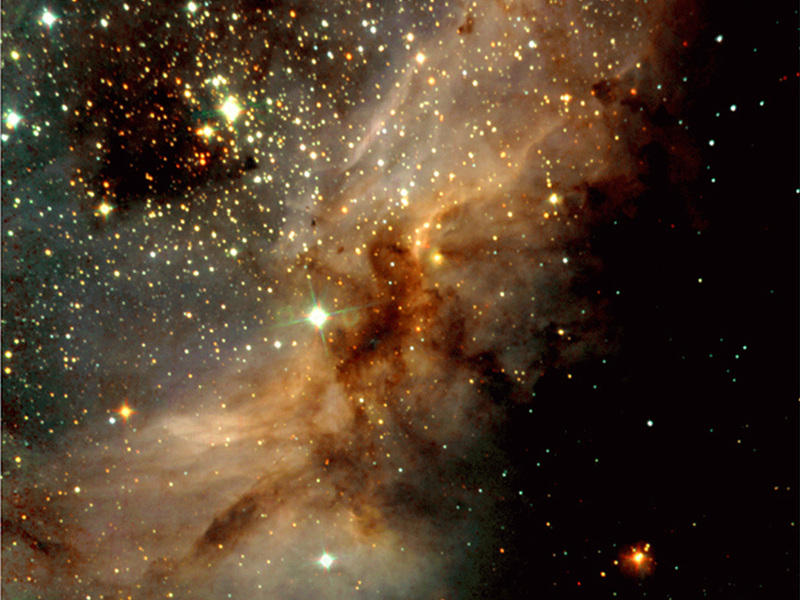 A cluster of young stars in the upper-left part of the photo, so deeply embedded in the nebula that it is invisible in optical light, is well visible in this infrared image. Technical information : The exposures were made through three filtres, J (at wavelength 1.25 µm; exposure time 5 min; here rendered as blue), H (1.65 µm; 5 min; green) and Ks (2.2 µm; 5 min; red); an additional 15 min was spent on separate sky frames. The seeing was 0.5 - 0.6 arcsec. The objects in the uppermost left corner area appear somewhat elongated because of a colour-dependent aberration introduced at the edge by the large-field optics. The sky field shown measures approx. 5 x 5 arcmin 2 (corresponding to about 3% of the full moon). North is up and East is left. Position (Dec): -16° 10' 37.34"